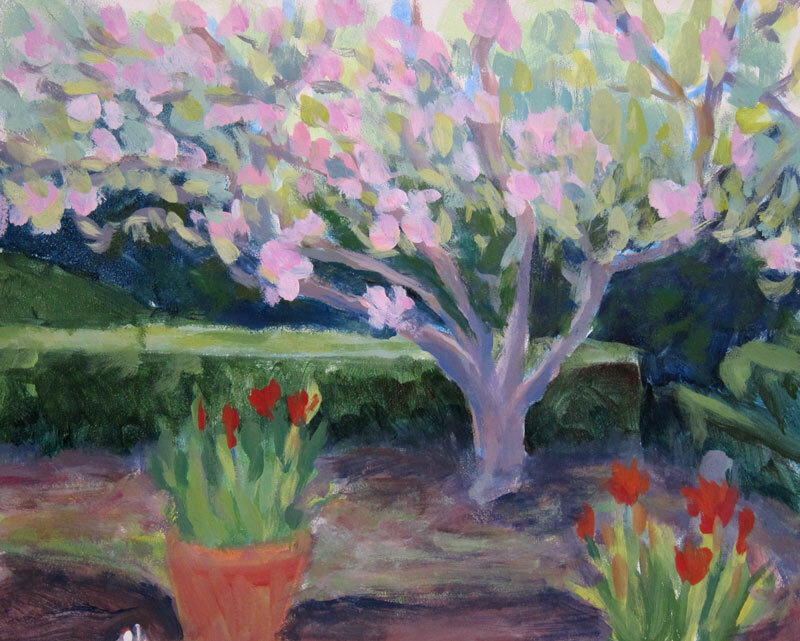 The tulip trees (Saucer Magnolias) and tulips were blooming when we painted at Blake Gardens on a sunny Friday a week ago. 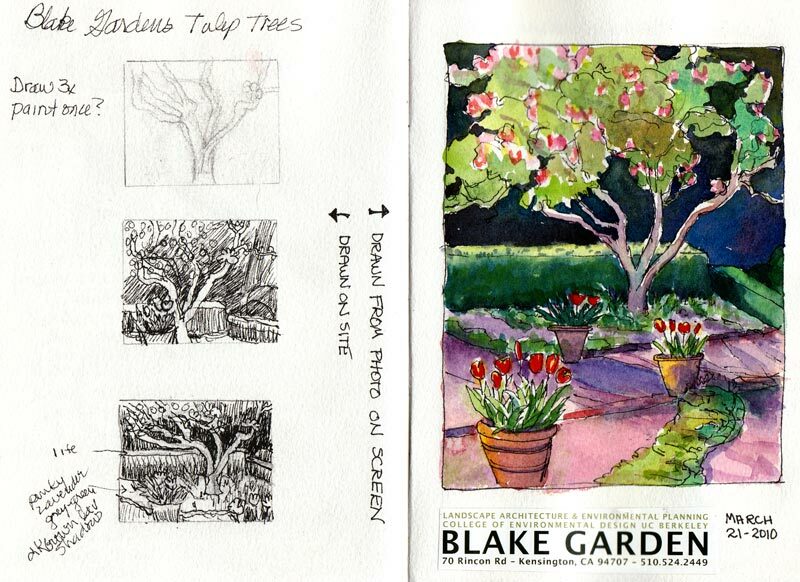 Of the multiple sketches and paintings I did of the scene, I think I’m happiest with the one above, done in my journal when I got home, from a combination of memory and photo. I clipped the text from their brochure and pasted it on the journal page. After I picked my spot to paint and set up my easel, I did several thumbnail sketches (left below) to plan my composition. While each thumbnail improved on the one before it, none were great compositions and as a result neither was the plein air painting I did on site. I was working with Golden Open Acrylics, my first time trying them outdoors. A Golden expert suggested I put a drop of Golden Open Acrylic Thinner atop each blob of paint to keep them moist when painting outdoors. Instead, thinking I was so clever, I mixed about 25% thinner with 75% water in a spray bottle and misted the paints occasionally. But I should have taken her advice as my method didn’t work. She’d warned me that adding water to the Open paints will make them dry faster, which it did, and they started getting icky-sticky about the time I needed to quit and head for the critique anyway. Indoors they stay wet all day and in a closed palette, for a week or two. 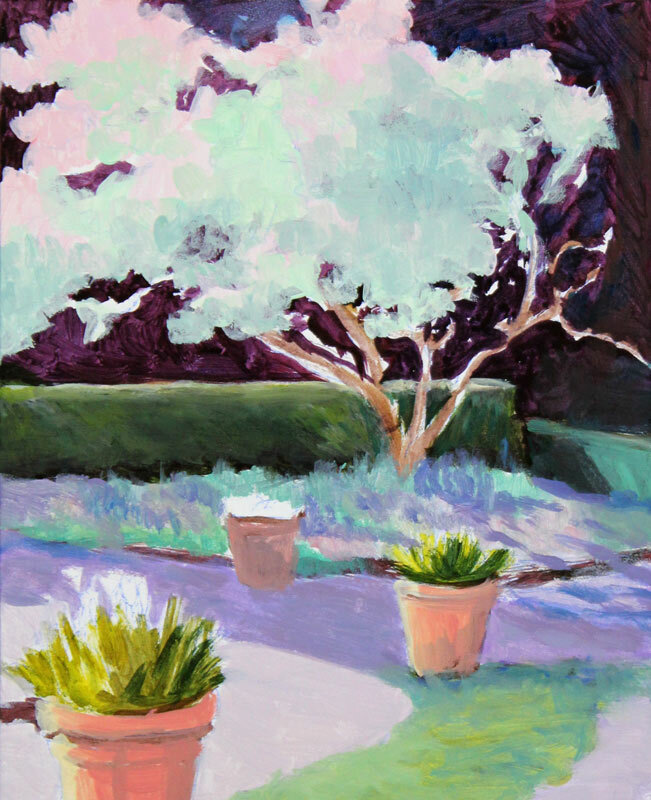 The plein air painting was so UGLY that I’m glad I only expect my plein air paintings to be learning studies. 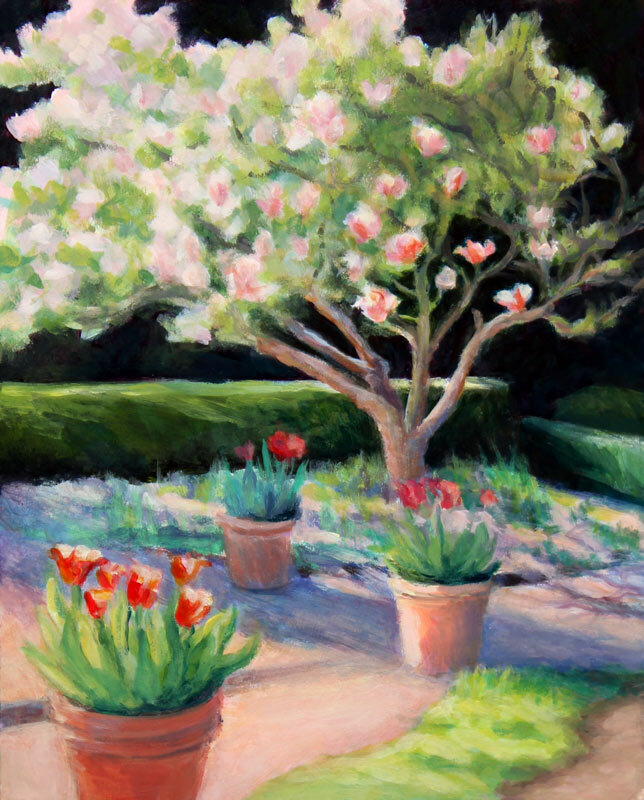 My plein air painting goal is to fully experience and participate in a scene and embed my memories of color, light, texture, sounds and scents. 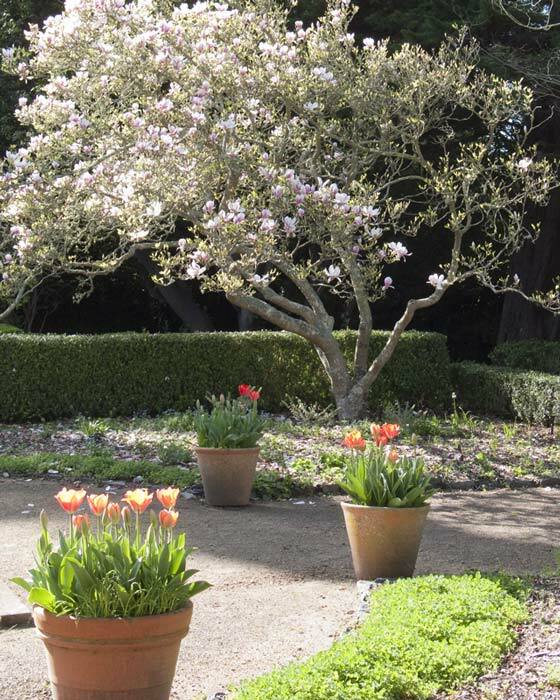 And there were sounds and scents: not only were the many magnolias overly fragrant, but shortly after I set up, two gardeners fired up a gas-powered industrial-strength chain saw, cut down a huge tree and sawed it to pieces about 20 feet away from me. The sound was horrible and the smell was worse. Below is a photo taken when I first arrived, cropped into a more pleasing composition. I like the diagonals and the way shapes of shadows and colors lead the eye into and around the painting. From my watercolor sketch and the photo above, I started working on a studio version of the painting. Below is the underpainting with the main shapes and colors blocked in. I liked just as it was and was hesitant to paint over it so I left it for a few days before working on it again until it decided it was finished. Thanks for showing the process at times in making your artwork. It’s good that digital cameras are so convenient for quick shots as work is in progress. Sometimes the early ‘underpainting’ makes a better picture than the final finished one – not that I’m having a go at this one. Lovely picture and a reminder of gorgeous gardens. I also appreciate the way you take us along on your sketching ventures, and then walk us through your thinking and painting process. That last word, process, is always the sticker for me. Like many people, I rather want it right the first time. That’s my heart. My head knows that each step along the way leads to something something closer to what I have in my imagination. 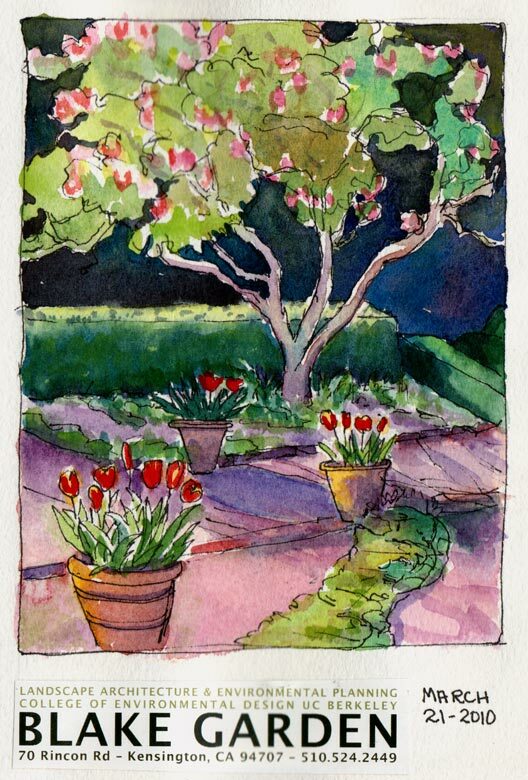 Your garden painting is charming and nicely composed. I am attracted to the variety of blues behind the tree. Looks like you had a good outing, though! Thanks for the tip about the Open Acrylics. I got the set you suggested (just the primaries to mix colors) but no mediums. Besides the thinner would you suggest other mediums? Thank you for sharing your experience and process. It is really helpful when we all contribe our learnings. I really like your painting. I can feel the gentle spring breeze. The colors are gentle and lovely. Your final composition is very interesting. Great job! What a pretty place that must be, Jana. Thanks for showing all the stages and your working methods. My fav is the top sketch where you’ve added that printed section – it looks like a travel poster and I’d imagine them using it for a brochure! Enjoying your artwork. I love coming across sketches of places I know. Borges Ranch, Pinole (where I attended H.S), spots in El Cerrito, etc. Lovely painting and great post. Have a great Easter Weekend. These paintings are beautiful. I love the chromatic modeling on the tree!